Managing the IT infrastructure for a financial institution can be painful. Whether it's backing up confidential data, blocking a new software virus, managing the latest loss (or theft) of a bank laptop, trying to comply with evolving regulatory requirements, or simply dealing with rogue "IT hobbyists" and naïve bosses, people just don't understand the expertise, time and patience required. In this webcast, gain valuable management insights from the IT Directors at Home Bank of Louisiana, hear their discussion of common IT systems management problems, and learn how these leaders revolutionized their banks using IT automation technology. Education IT leaders today are charged with doing more with less. Without a travel budget. Their users have high expectations, such as collecting, managing, and applying data for assessment and decision-making, as well as providing Web 2.0 tools and robust Web access from different education facilities. In order to address the goals and needs of administrators, teachers, and staff, education IT pros must have the most effective management systems in place. Remote management sounds easy but how does it work? View this webinar and learn the challenges, solutions, and results from IT admins who have automated key IT tasks, developed solid business processes and implemented best practices to help them actually do more - with less - without leaving their desk. No one knows better than financial services IT executives about the costs of IT systems downtime – it impacts everything from revenue generation to productivity to compliance to corporate reputations. However, many organizations are still dealing with IT systems availability issues in reactive and inefficient ways – not only unacceptable in terms of service and data integrity issues, but also in terms of the impact on workforce productivity and company profitability. IT automation is the key to delivering a proactive, results-based IT service model. At this free, on-demand webinar moderated by Bank Systems & Technology,, you will hear about the benefits of an integrated, automated approach to managing remote IT systems. You will get an insiders' look at five steps proactive financial institutions can take to improve service delivery capabilities – resulting in increased productivity, consistent service levels, improved utilization of staff, expanded service capabilities and cost reduction. Gerald Beaulieu, IT Automation Expert, Kaseya and Loren Gracer, Network Engineer, Health Delivery, Inc.
Healthcare IT leaders today are charged with doing more with less. Without a travel budget. Their users have high expectations, such as collecting, managing, and applying data for assessment and decision-making, as well as providing Web 2.0 tools and robust Web access from different healthcare facilities. In order to address the goals and needs of administrators, doctors, and staff, healthcare IT pros must have the most effective management systems in place. Remote management sounds easy but how does it work? View this webinar and learn the challenges, solutions, and results from IT admins who have automated key IT tasks, developed solid business processes and implemented best practices to help them actually do more - with less - without leaving their desk. Through a focused case study with Loren Gracer, Manager of Networks for Health Delivery, a premier Midwest health care organization, we’ll take a look at how automating the service desk can achieve practical results effect transformative changes within any enterprise organization. We’ll look at some key pitfalls that organizations encounter in the quest for automating their service desk, and with technical expertise from Javier Esteve, Enterprise Services, Kaseya, we’ll discuss better strategies for workforce management, ticketing, increasing IT ROI while decreasing TCO and leveraging key metrics in order to constantly improve service delivery. Have you been thinking about leveraging ITIL? Have you set it aside as “next year’s” initiative because you think it’s too complex, costly or you just don’t have the time? 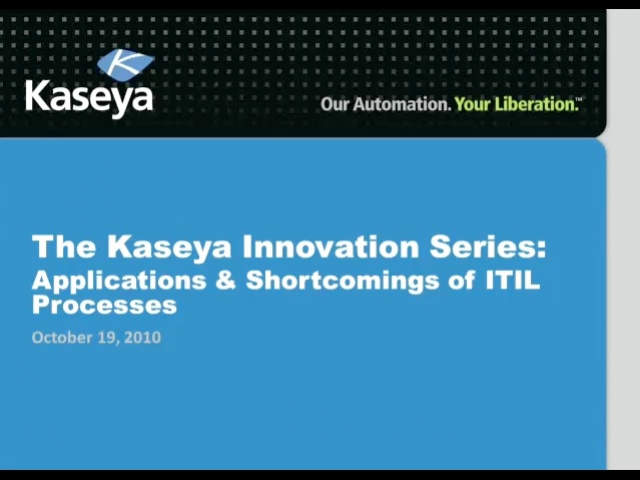 Join Kaseya for an insightful presentation on understanding the fundamentals of ITIL and how you can easily transform your IT operations with an automated, process driven solution based on ITIL standards. Join us as we speak with Greg Franseth, Director of Information Services, University of Kentucky about his work to put ITIL in action using Kaseya at a top academic institution. We’ll look at the details of the technologies as applicable in any Enterprise environment, challenges and opportunities for Corporate IT, and before-and-after analysis of the ITIL process with moderator Anthony Juliano, CTO, Landmark Ventures. Managing the IT infrastructure for a healthcare organization doesn’t have to be a thankless job. View this free on-demand webinar and learn about the 10 most common ailments in healthcare IT systems management, as well as misconceptions of healthcare IT systems management and best practices for managing highly distributed healthcare IT systems. Finally, discover how IT automation technology can help you prevent systems management disease. Every year, as the demands on your IT group increases, how will you respond to change with limited resources and shrinking budgets? Employees, customers and management depend on you to deliver efficient IT services across multiple locations. How will you do it all AND be innovative at the same time? If you’re too busy patching, fixing and updating, its hard to focus on new ideas. From Remote Access to Remote Support to Complete IT Automation, The Kaseya IT Management Suite provides solutions for IT environments of all sizes.